Is The Judge Parker Courthouse Haunted? The Judge Parker courthouse was built in 1937 in the classic revival style for a seemingly unknown reason. The first building to act as a courthouse and post office for the area was commissioned in 1887 and completed 2 years later at a cost of $100,000. The building seemed to be working perfectly well but for some unknown reason a new building was ordered to be built just 30 feet away from the original, even though there was no damage or clear reason to replace the original building. When the new building was completed the old courthouse was demolished and the new one was known as the "Fort Smith U.S. Post office and courthouse". It later became known as the Judge Parker courthouse due to the infamous Judge Isaac C. Parker, who was remembered for his harsh sentences and all of the hangings that took place here on his orders. The building has remained relatively unchanged since its construction apart from the addition of 2 more wings added during 1964 to add more space. Today much of the building can be viewed by the public and the it was added to the national register of historic places in 1999. Judge Parker was infamous for ordering people to be hanged here, even when their crimes did not deserve such a harsh punishment. In his few years of acting as a Judge he sentenced 160 people to death, which earned him the nickname "The Hanging Judge". Only 79 of those he ordered to be killed actually received their punishment from the noose, the others died in imprisonment due to poor conditions and at the hands of the guards. The problem with anyone imprisoned in an American jail during the late 1800's to early 1900's is that the guards could do anything they wanted to you, beat, torture or even murder a prisoner whenever they wanted and there was literally nothing the incarcerated population could do about it. With all of these deaths and ill treatment of individuals you may expect that the spirits believed to reside here would be of the prisoners who died here, but for some strange reason that isn't the case. There is thought to be only one ghost that haunts the courthouse, and that is the spirit of Judge Parker himself. He was known for being very fond of his work during his life and enjoyed convicting criminals, which may be the reason he chose to linger around the place he was most connected with in life. 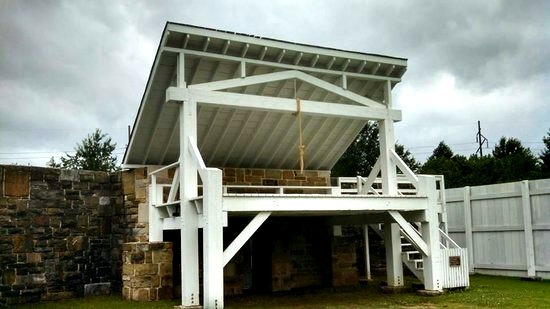 The picture above is of the hanging stand where all of the hangings on the grounds took place, though the original wooden structure has been torn down and replaced with a replica. This is the spot were most paranormal activity has been experienced, with pretty normal stories such as people hearing footsteps walking across the wooden boards of the hanging stand and people feeling watched and very uncomfortable in the area. The courthouse itself has a few stories attached to it but very few in comparison with the hanging stand. Electrical equipment is also known to malfunction quite a lot in the area, with cameras not being able to take pictures and batteries suddenly draining.